iExtreme Youth Winter Jacket Black, Red, and White Size 2T BNWT **FREE SHIPPING! Both pieces are size 3T and black. shorts are slug knit with side pockets and also cargo pockets. 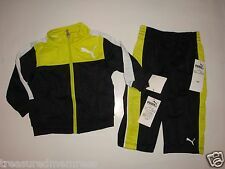 Show off your little one in this two piece ensemble from Puma. Pull on pants have elastic at waistline, bright color-blocking and Puma logo on left leg. Fabric content: 100% polyester. BATMAN - Toddler Boys Size "0/3 Months" GRAY 2 Piece Premium Outfit Special SIMPLY EXQUISITE. BATMAN: Has Designed Hi-Fashion Superior Quality Outfits with Boldness and Elegance While Still Remaining Affordable. Size 3T fits: weight 31-33 lbs. height 36-39". Show off your superhero in this adorable two piece Batman ensemble. Nice for gift giving! Fabric content of both shirt and shorts: 100% cotton. Size: 6-9 Months Boys. Type: Shirt and Pants. Color: Black. Plaid bear coverall and hat. 80 percent cotton-20 percent polyester velour. polyester-rayon woven plaid. Machine washable. Build his wardrobe in style with this adorable 2 piece outfit from Nannette. The set includes Mickey Mouse shirt and matching shorts. Machine washable. Maintains shape and fit wash after wash. Size: 12 Months (See size chart in last photo). HANNA ANDERSSON. The age and US size are helpful yet approximate conversions. Hanna Size. Gentle stretch cuffs. Ribbed stretch waist with working twill tie. Soft Black. Stripe Lined Hoodie/Sweatpants Set. This is so cute! Long sleeve knit shirt red piped color. Christmas Collection. 27" - 28 1/2". 20 - 26 lbs. 29" - 30 1/2". 12 - 18 Months. 29 - 35 lbs. 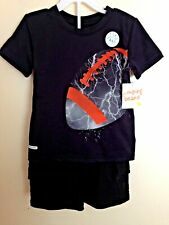 NWT Boys Dressy Jonathan Strong 3 piece outfit size 2T. Jacket: solid hue; single-breasted; long sleeves; 2 buttons at front; lined Pants: allover Herringbone pattern; pressed crease in front; elastic waistband Shirt: solid hue; collar; long sleeves; front button close Bow tie: allover plaid print Jacket: cotton; pants, tie: polyester; shirt: cotton polyester Jacket/pants: dry clean; shirt: machine washable Imported.